IMG_3726 : Horae for the use of Rouen, c1460-1475, Normandy, Musée d’Art de Joliette. Nuns & priests praying around a coffin, floral decorations. IMG_3630 : Hours of Philippe de Montholon, c1460, Hainaut/Dijon, Archives of the Jesuits in Canada. Adoration of the Magi. IMG_3632 : Rhodes Hours, c1460-1465, Paris, McGill University Library. Annunciation scene. 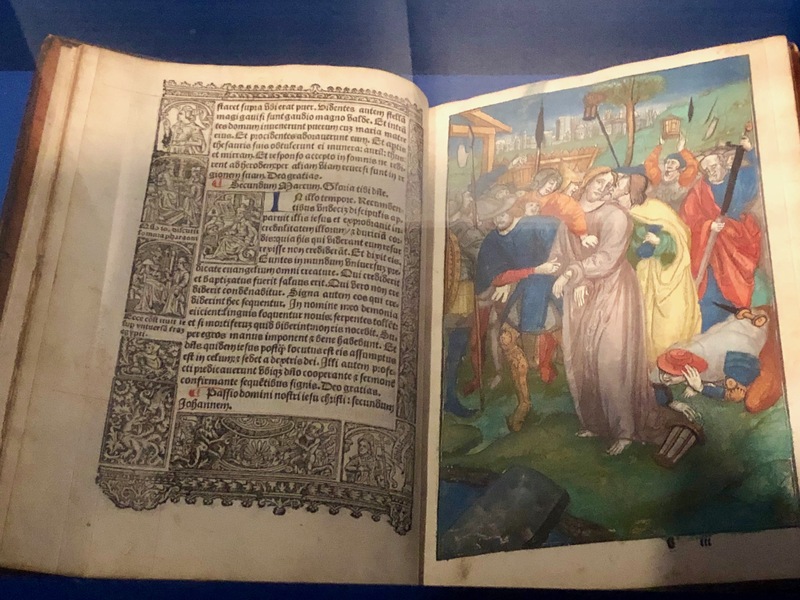 IMG_3635 : Horae for the use of Rome, c1390-1400, Bruges/Florence, UQAM Arts Library. Ornemental capitals and decorative margins of coloured and burnished gold vines. Announciation, decoration incorporating grotesques & animals. 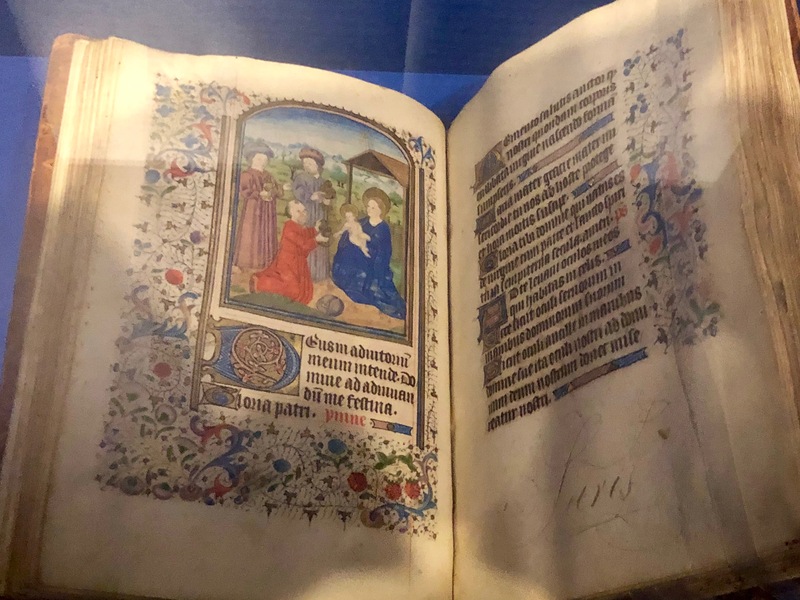 IMG_3637, 3639 : Masmines et Bouthillier Hours, c1500, Ghent, Archives of the Jesuits in Canada. Heraldic crest of two Flemish families with illustration of the crucifixion. IMG_3640 : Bordures décorées du nom des possesseurs, c1475-1480, Lyon, McGill University Library. Personnalised with the names of the owner, here to commemorate a wedding. IMG_3642 : Horae for the use of Rome, 1515, Paris, Séminaire de Saint-Sulpice (Montréal). In-quarto format. Engraving: arrest of Christ. 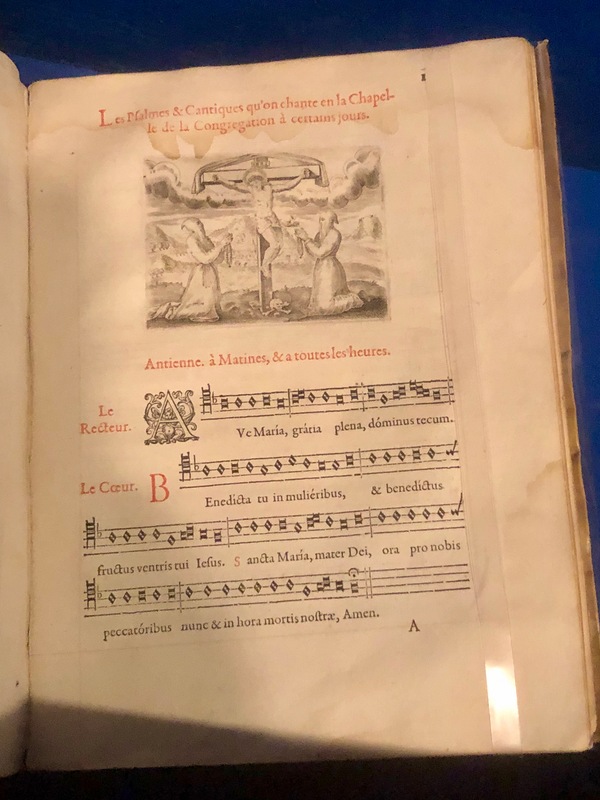 IMG_3644 : Heures de Notre dame, a l’usage de Rome, selon la reformation de notre S. Pere Pape Pie V, 1583, Paris, Musée de l’Amérique Francophone (Québec). Printed music sheet. IMG_3646 : Hore intemperate Virginias Dei génitrices Marie for the use of Rome, 1516, Paris, McGill University Library. Printed on vellum, illustration of King David in prayers and the coronation of King David. IMG_3648 : Horae for the use of Rome, 1504, Paris, McGill University Library. 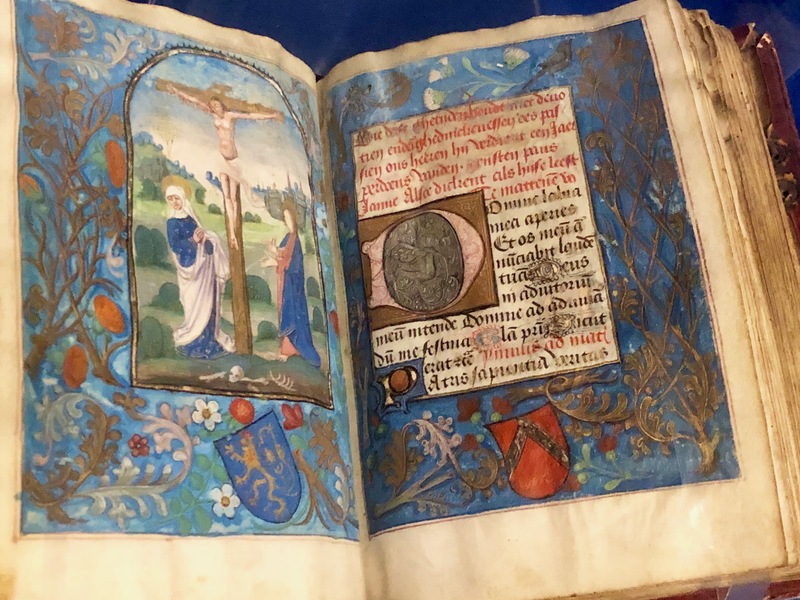 Printed Book of Hours. Only one other copy of this edition known (in Munich). Engraving of the “Anatomical Man with the Fool” showing the organs, the Planets for the blood-letting time-table, and explaining the four humours: blood, phlegm, yellow and black biles. 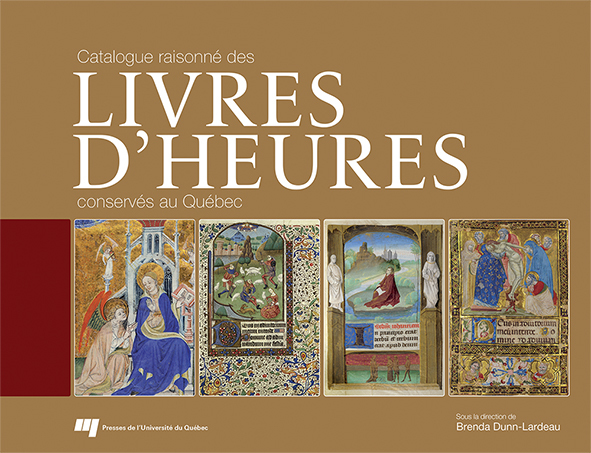 IMG_3650 : Hours for the use of Toul, c1500-1510, 1547, 1560, Paris, Musée de l’Amérique Francophone (Québec). Hybrid book resulting from the assemblage of different editions with a manuscript leaf in latin detached and inserted in the book of hours. 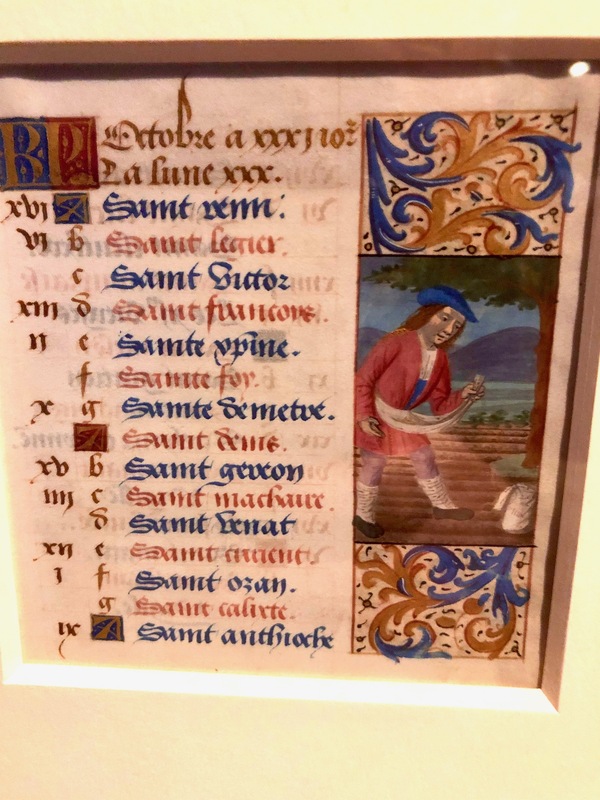 IMG_3652 : Calendar of the month of October, c1475-1480, Lyon, McGill University Library. Calendar giving the feasts of saints and liturgical feasts, illustrated signs of the zodiac or work related to each month. The front is illustrated with a seeding scene (on the back we find a scorpion). IMG_3655, 3656 : Folio from a Book of Hours for the use of Paris (displayed on the screen of a tablet), c1430-1435, Paris. 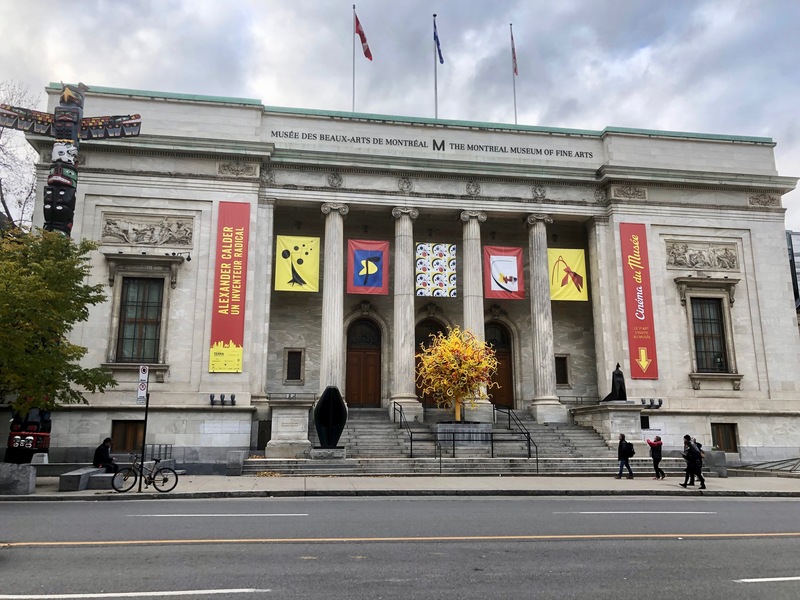 Musée des Beaux-arts de Montréal. Annunciation. 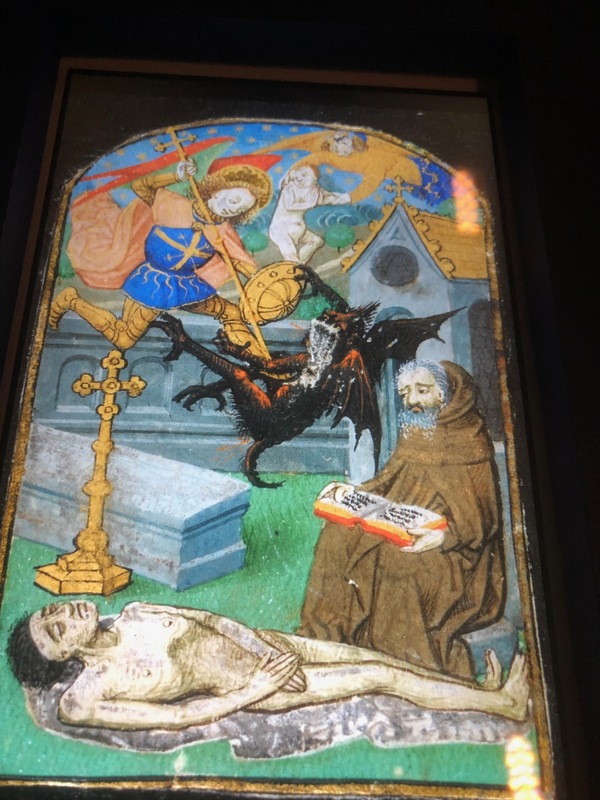 IMG_3657 : Seven miniatures from a breviary (displayed on the screen of a tablet), c1470, Rouen, McGill University Library. Illustration of the psalter: David pointing to his mouth (Psalm 38). 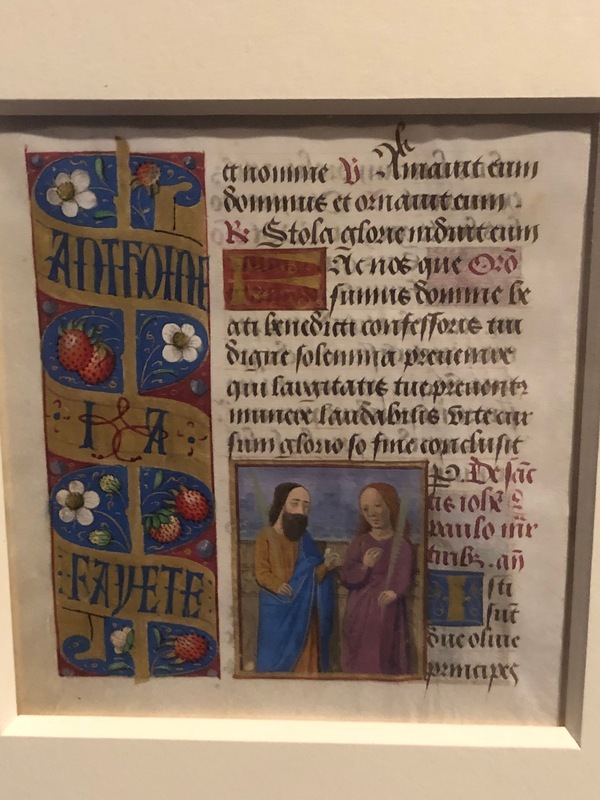 IMG_3658 : Seven miniatures from a breviary (displayed on the screen of a tablet), c1470, Rouen, McGill University Library. Illustration of the psalter: David ringing the bells (Psalm 80). 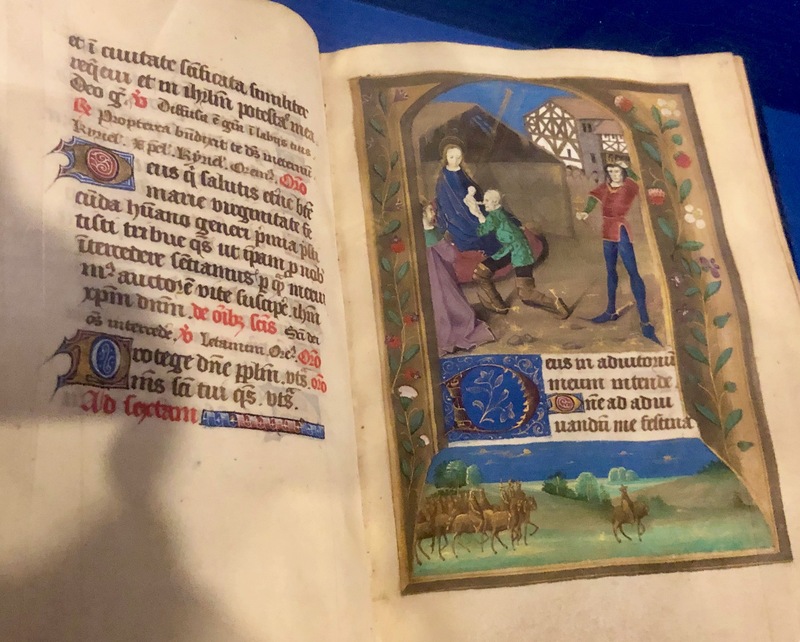 IMG_3659 : Seven miniatures from a breviary (displayed on the screen of a tablet), c1470, Rouen, McGill University Library. Illustration of the psalter: Choristers at a lectern (Psalm 97). 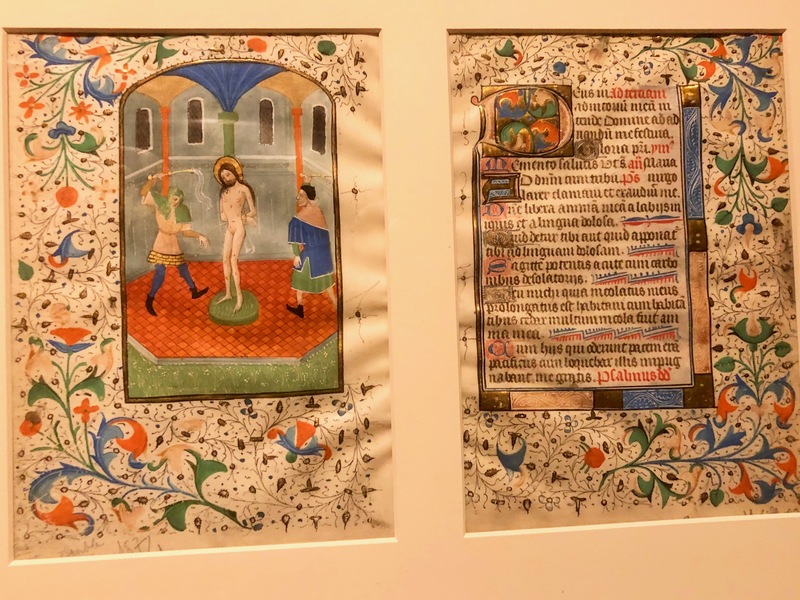 IMG_3660 : Seven miniatures from a breviary (displayed on the screen of a tablet), c1470, Rouen, McGill University Library. Illustration of the psalter: Annunciation (Office of the Virgin). 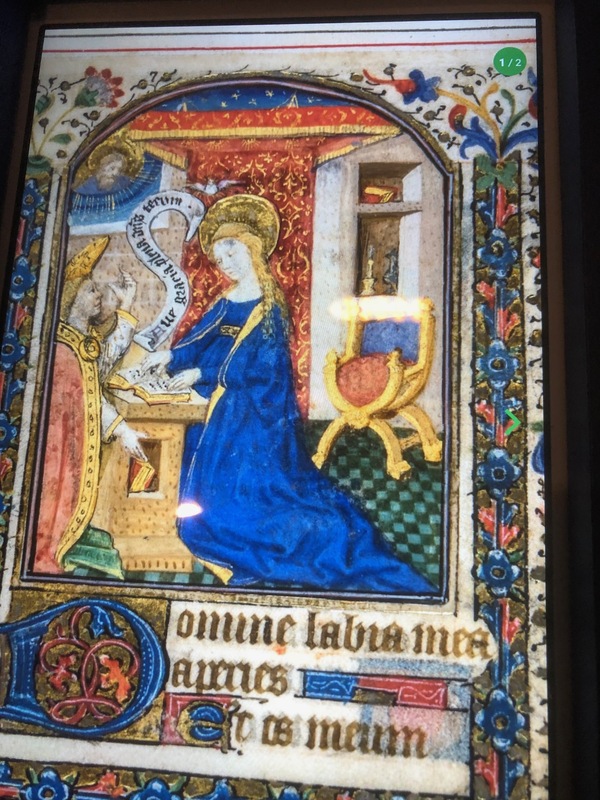 IMG_3661 : Seven miniatures from a breviary (displayed on the screen of a tablet), c1470, Rouen, McGill University Library. Illustration of the psalter: “a corpse in a cemetery above which takes place a fight between Saint Michael and the Devil for the soul of the dead man. Meanwhile, a hermit monk is praying, with a prayer book open on his knees” (Office of the Dead). IMG_3685 : Seven miniatures from a breviary, c1470, Rouen, McGill University Library. Illustration of the psalter: Annunciation (Office of the Virgin). Those illuminated miniatures are REALLY small ! 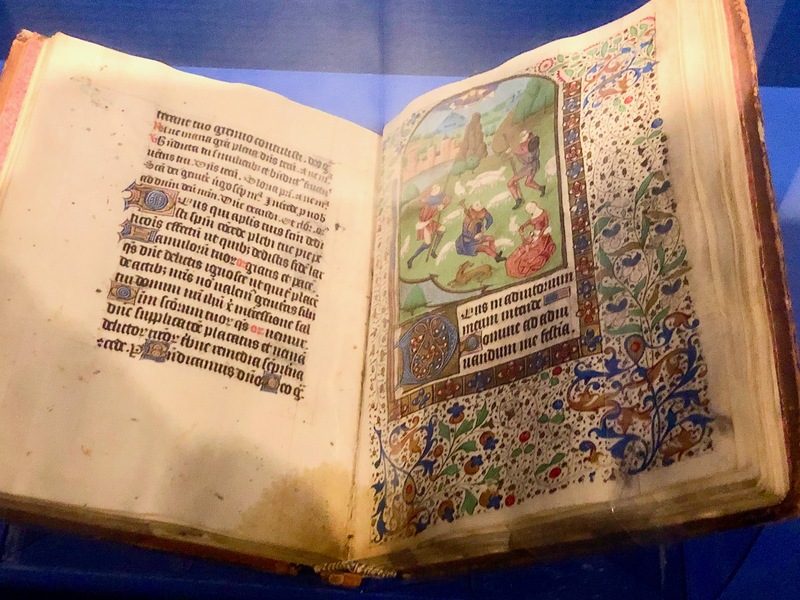 IMG_3664 : Hours of Pellegrin de Remicourt and Madeleine Symier, c1470-1475, Rouen, UQAM Arts Library. Annunciation to the Shepherds. IMG_3666 : Tabouret-Bernard Hours, c1480-1490, Burgundy, McGill University Library. Adoration of the Magi. IMG_3668 : Officium beate Marie secundum usum Romanum, c1500-1510, Bruges, McGill University Library. Scene of the Massacre of the Innocents (Vespers), with floral and insects patterns. Very small book. IMG_3670 : Horae for the use of Paris, c1475-1480, Paris, Musée des Beaux-arts de Montréal. Pentecost scene (the Holy Spirit descending upon the apostles “in the form of a dove with rays of fire to symbolize the gift of tongues, conferred on the disciples of Christ to evangelize the peoples”. IMG_3672 : Saint Sébald de Nuremberg, c1515-1525, Flandre, Musée des Beaux-arts de Montréal. “St. Sebald of Nuremberg, patron saint of the city. Sitting in an armchair, he holds in one hand a pilgrim’s staff, and on the other, (…) a model of a church. (…) On his hat are four pilgrim insignia”. Architectural decor and chivalrous tournament. 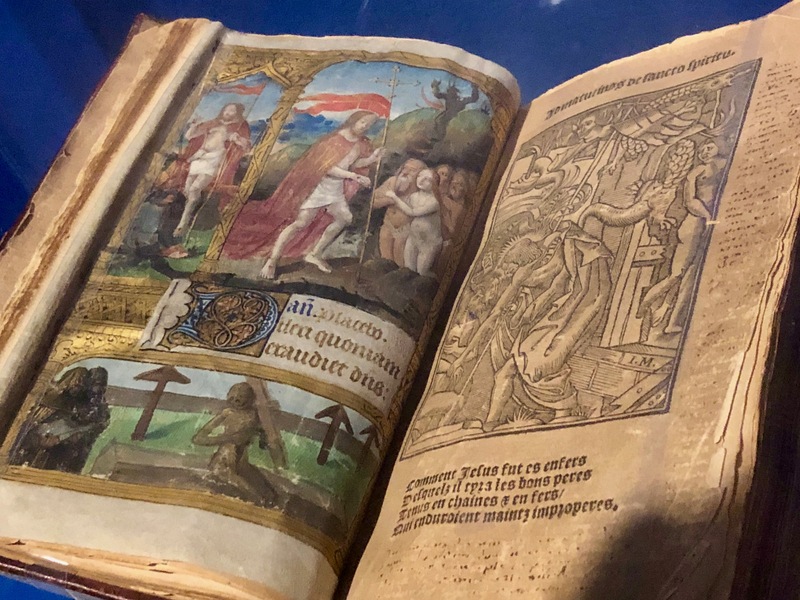 IMG_3674 : Le Christ aux outrages, 1525, Paris, McGill University Library. Engraving painted with watercolor illustrating the affronts and tortures that will have to undergo Christ during his Passion. 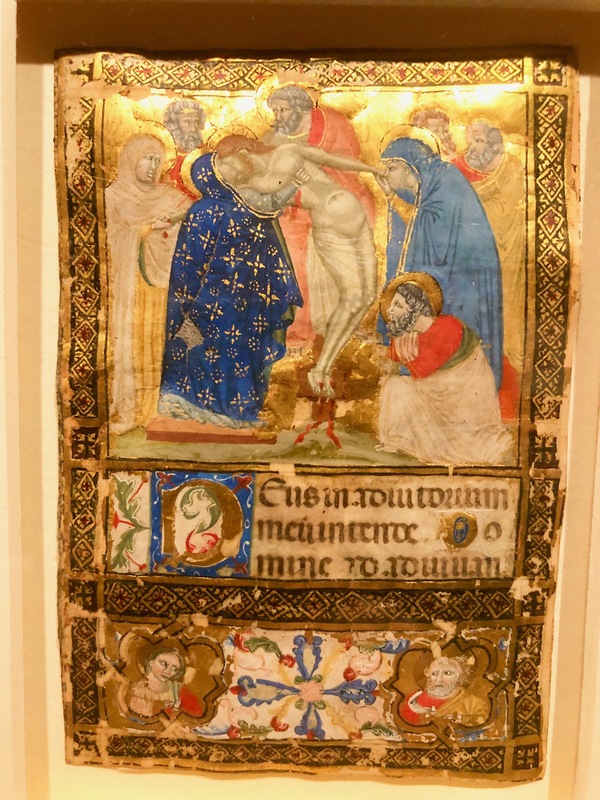 However, the translation (not approved and prohibited by La Sorbonne) complains rather of the competition of the Italian actors to the court of François I.
IMG_3690 : The Flagellation and the beginning of Terce, c1425-1450, Bruges, McGill University Library. Folios of a book of Hours manuscript in Latin for the use of Rome. 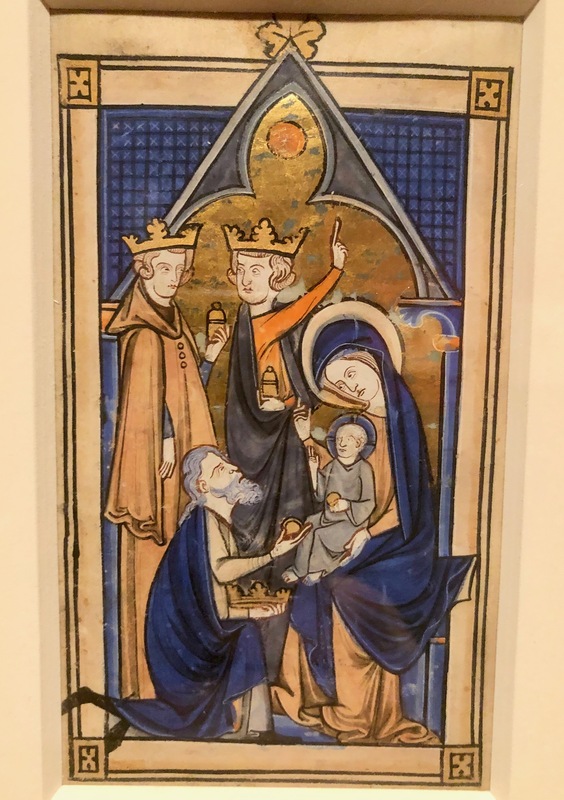 IMG_3692 : Adoration of the Magi, c1500, Rouen, McGill University Library. Folio of a book of Hours manuscript in Latin for the use of Rouen. 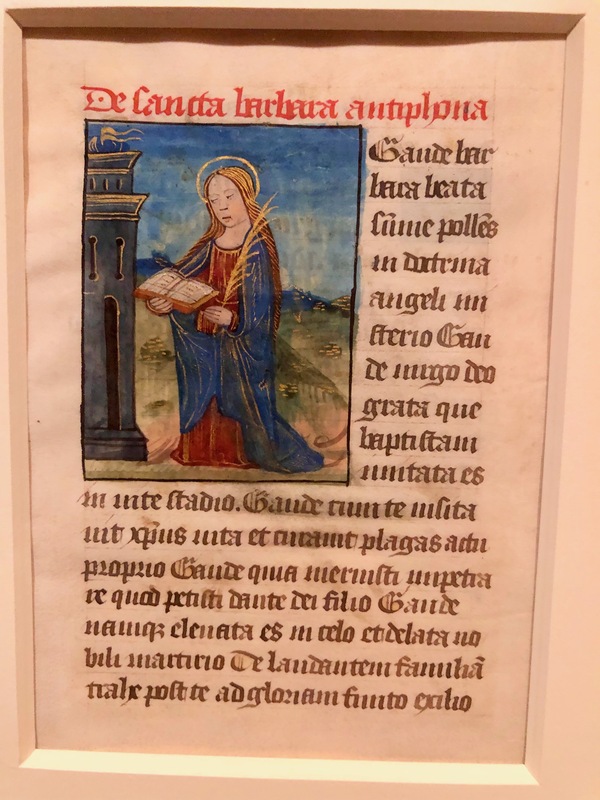 IMG_3694 : Intercessory prayers to Saint Barbara, c1475-1485, Paris, McGill University Library. 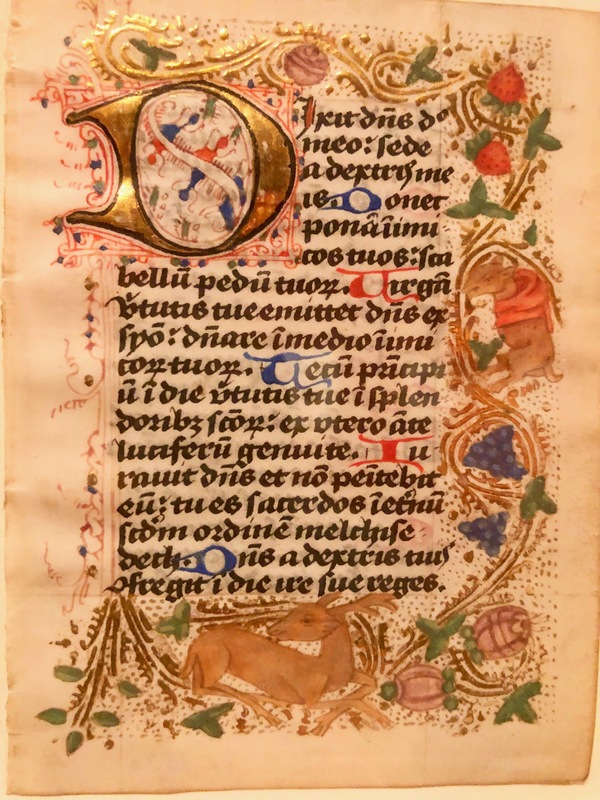 Folio of a book of Hours manuscript in Latin. IMG_3696 : Deposition of Christ, c1375, Venetia, Musée des Beaux-arts de Montréal. Folio of a book of Hours manuscript in Latin. IMG_3698 : Woman reading in a Studiolo, c1375, Venetia, Musée des Beaux-arts de Montréal. Folio of a book of Hours manuscript in Latin. IMG_3700 : Presentation of Jesus at the Temple, c1400-1415, Paris, Musée des Beaux-arts de Montréal. Folio of a book of Hours manuscript in Latin for the use of Besançon. 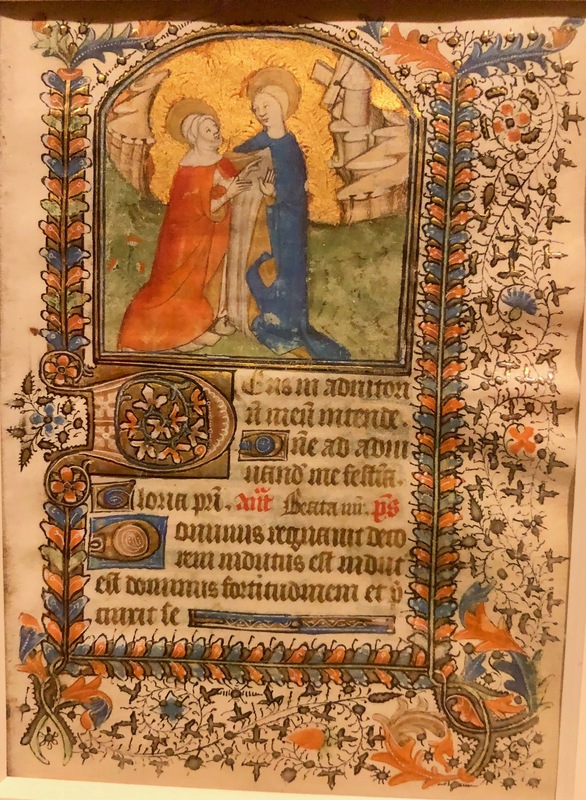 IMG_3702 : Visitation, c1430-1440, Bayeux, McGill University Library. Folio of a book of Hours manuscript in Latin for the use of Bayeux. Scene of the Visitation of Mary to her cousin Elizabeth. IMG_3703 : The Triumph of the Virgin, c1430-1440, Bayeux, McGill University Library. Folio of a book of Hours manuscript in Latin for the use of Bayeux. Scene of the Triumph of the Virgin next to Christ. 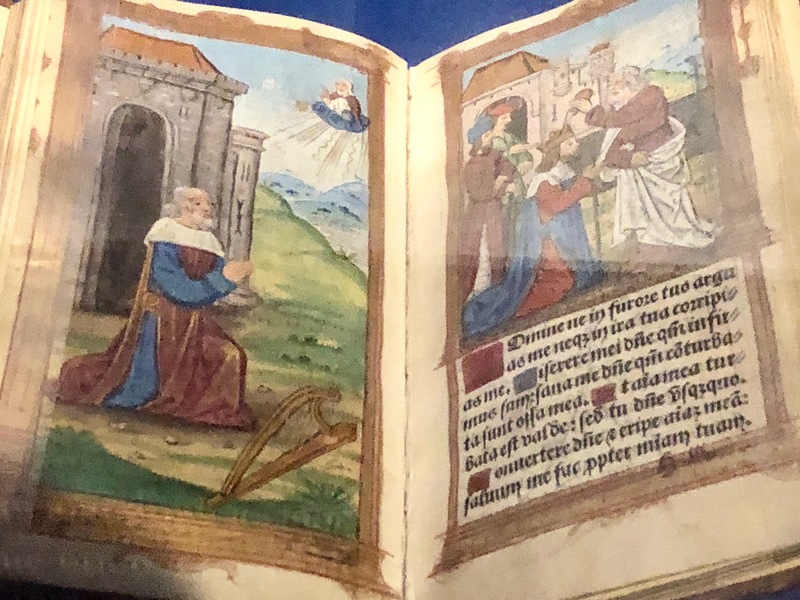 IMG_3705 : The Journey of Saint Ursula, c1480-1490, Augsbourg, McGill University Library. Watercolor engraving depicting “the arrival in Cologne of Saint Ursula with some of her eleven thousand virgins (…) pursued by the Huns, of which we see an assailant, a sword in the belt”. 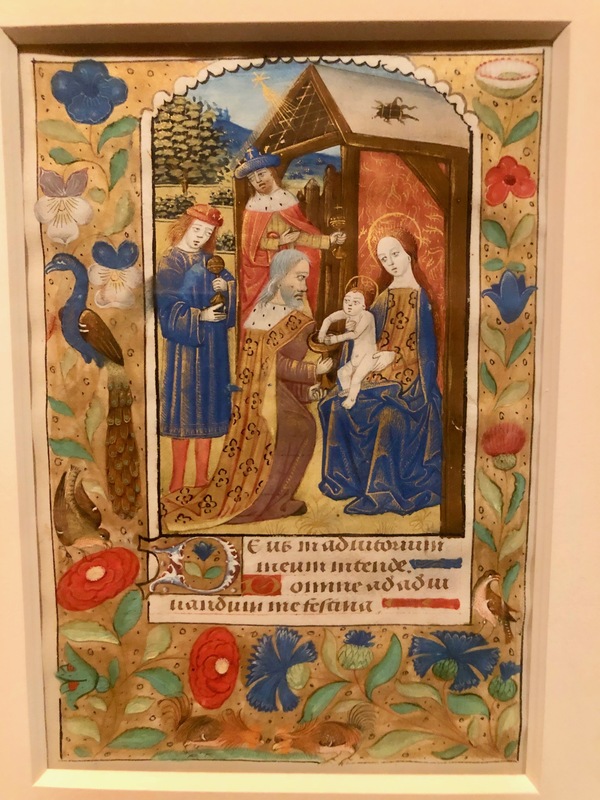 IMG_3707 : The Nativity, c1500, Bavière, McGill University Library. Miniature cut from a manuscript devotional work. IMG_3709 : Saint Helena and the True Cross, c1520, South Germany, McGill University Library. Independent miniature on parchment. Scene of the pilgrimage of St. Helen in the Holy Land around 327. Helen and Constantine, “staring at a seated figure who has just been resurrected with the help of the miraculous power of the True Cross”. 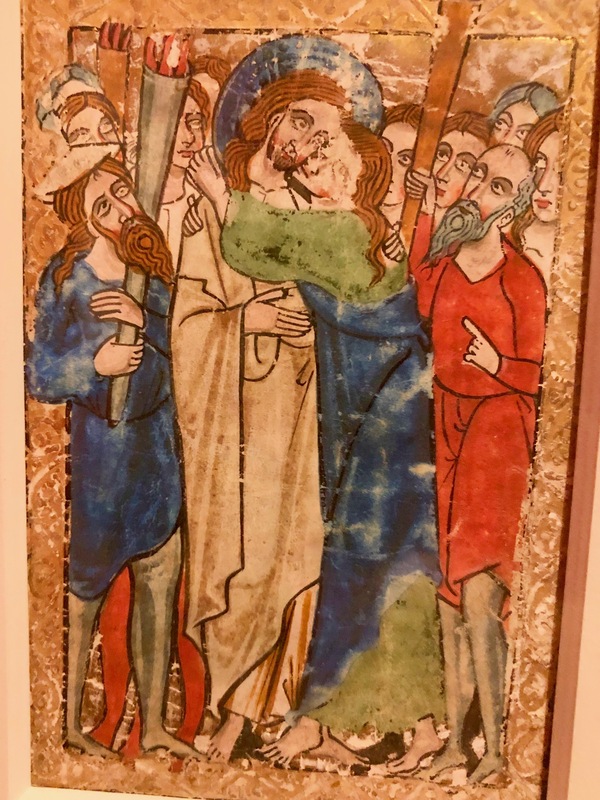 IMG_3711 : The arrest of Christ and the Kiss of Judas, c1235-1250, Augsbourg, McGill University Library. Folio from a manuscript psalter. IMG_3713 : Adoration of the Magi, c1225-1270, Paris, Musée des Beaux-arts de Montréal. Folio from a manuscript psalter, a Book of Hours or a breviary. 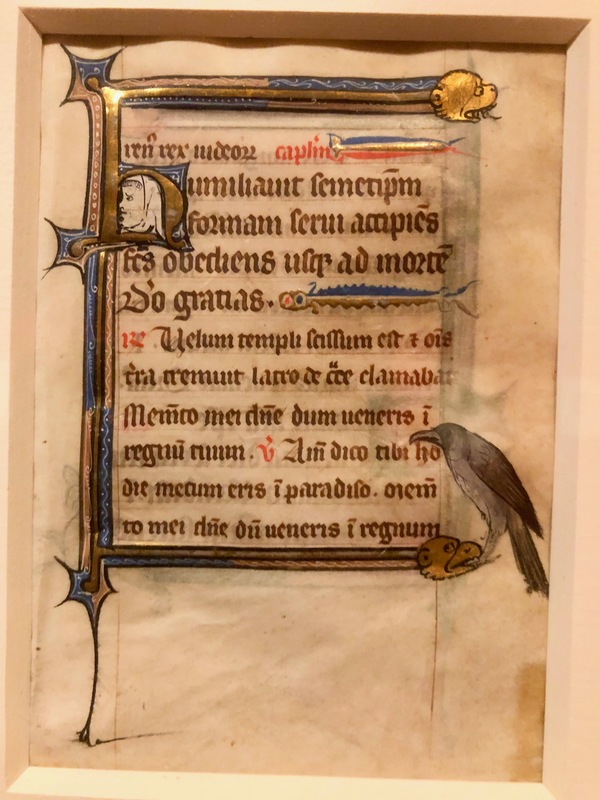 IMG_3715, 3717 : Breviary (extracts), c1300, Bruges?, McGill University Library. Folio from a manuscript breviary in latin.